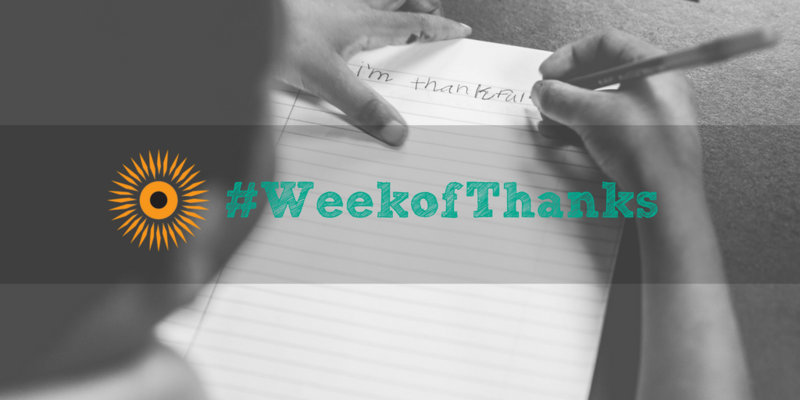 Thanksgiving is just a few short days away, and we at School on Wheels are celebrating how thankful we are for YOU with a Week of Thanks. We have SO much to be thankful for, and we want to kick off the holiday season by sharing what we’re grateful for, as well as ways that you can help give back to our students. We’ll be sharing more each day on social media, but in case you like to plan ahead, use this handy graphic and information below to join us during this #WeekofThanks! Before you run to the store to grab your last minute Thanksigiving goodies, make sure to sign up for Kroger Community Rewards. Every time you shop, swipe your Kroger Plus card and our programs receive a portion of the proceeds. Enrolling is easy – click here  to get started. Make sure you have your Kroger Plus card on hand, and search for us by using our name, School on Wheels, or our organization number, 66739! Today we’re giving thanks for our amazing Program Coordinators. The support they provide to our tutors, students, and parents of School on Wheels students is incredible. We’re so grateful for the time and dedication of these staff members to help our kiddos achieve academic success. Thank you, Program Coordinators, we couldn’t do what we do without you! Did you know that School on Wheels has over 400 volunteers who dedicate time every week to tutoring and mentoring homeless youth? We’re convinced that our tutors are some of most selfless, kind, and caring individuals around. During this #WeekofThanks, we want to make sure our volunteers know how much we value and appreciate all of the work they do to empower kids of all ages throughout the community. We’d like to express our sincerest thanks to all of you who have ever given to School on Wheels. Whether you’ve given of your time, your talents, or financially, YOU are the reason that we are able to impact the community and families impacted by homelessness. We couldn’t do what we do without you, and during this #WeekofThanks and #NHYAM month we’re just so grateful for all of YOU who help us make a difference. On Cyber Monday, we’re thankful it’s so easy for you to make a difference! While you shop Amazon, make sure you’re using smile.amazon.com. If you choose School on Wheels Corp. as your charity of choice, we get .5% back on every purchase. It’s a win-win! If you have a hard time remembering to switch to Amazon Smile before you make a purchase, check out this awesome Google Chrome add-on that redirects every Amazon page to Smile. Don’t forget one of the easiest ways to give back to School on Wheels — by purchasing items off of our Amazon wishlist, which gets shipped directly to us! This Giving Tuesday, it’s easier than ever to help propel a student to success. We’ll be sharing a story about the dreams of our students and ways that you can help make those dreams come true. Can’t wait until Giving Tuesday to give back and help break the cycle of homelessness? Donate today.